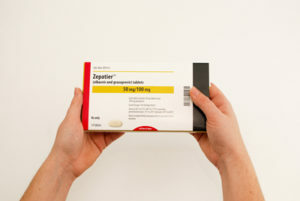 The Zepatier® Medication Package promotes patient medication adherence using a custom design that integrates a calendared blister clearly labeled by day on each individual pill cavity, highlighting the two week dosing regimen (2 two-week packages make up a monthly supply of Zepatier). Visual cues prompt medication taking and tracking. A 5/6th panel provides space for medication information, dosing instructions, and how to navigate the calendar. In addition, branding for Merck / Zepatier is easily seen on the outer package’s readable, flat space. The Zepatier package builds on WestRock’s legacy of designing medication packaging that’s proven to enhance adherence. WestRock’s enhanced adherence packaging is shown to achieve an 80% PDC with up to 37% more patients versus standard vials. 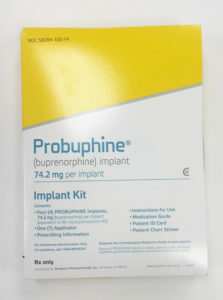 The Sharp Global Design team was asked to design and construct a packaging solution for Probuphine®(buprenorphine) implant in 2014 that would contain multiple components of various sizes, in a physician-friendly package. The challenge was to ensure that the design and usability of the packaged kit would effectively contribute to the correct use and administration of the drugimplant by physicians. The Sharp Design team partnered with Braeburn Pharmaceuticals during many stages of the product packaging development, including design, prototype development and finally, commercial production. Comments provided by the judges included “This implant kit seems very comprehensive for physicians, as well as for patients. The kit demonstrates the critical role that packaging and labeling can play in guiding professionals through safe and effective product use. 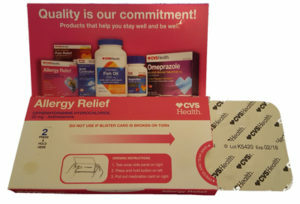 The font and colors printed on the package labeling are clear and promote comprehension, and the patient materials are also very clearly stated. The 3-D package design successfully accommodates a significant amount of product components and labeling materials in reasonable footprint. There are sufficient warnings and tracking features to further guide both professionals and patients for appropriate product use and security. The Probuphine is now in commercial production in Sharp’s facility in Allentown, PA. Many Over-The-Counter(OTC) products are used to treat the side effects of prescription medications – pain, constipation, etc. CVS was looking for a new way to guide patients to these OTC treatments in a way which also introduced them to the value of CVS Store Brand products. They selected WestRock’sDosepak Express package, in conjunction with a WestRock merchandising display located under the pharmacy checkout counter, to accomplish this objective. The private labeled, store brand products were launched in the stores in September, 2016, with 10 items currently in the program. Each package contains 14 tablets. While the term “compliance” is typically not associated with “take-as-needed” OTC products, the Dosepak Express format provides the convenience, ease of use, and portability necessary to promote proper adherence use by patients, while offering ample billboard space to accomplish CVS’ marketing goals. Med-ic® is an electronic compliance monitor that addresses non-compliance with prescribed medication by monitoring medication taking behavior in real time, tracking each dose removed by the patient. The entry submitted was a syringe package that not only would record the date and time a syringe was removed, but it allowed the patient or caregiver to indicate the injection location on a body part, upper arm, abdomen, buttocks or thigh. Med-ic can also monitor storage temperature to ensure product integrity. Med-ic creates a smart medicine package which keeps a history of the exact time the patient removed each tablet, capsule or syringe and can fit child-resistant packaging.